Hawaii’s coastline is threatened by coastal erosion, tsunamis, hurricanes, sea level rise, flooding, subsidence, earthquakes, and lava flows. 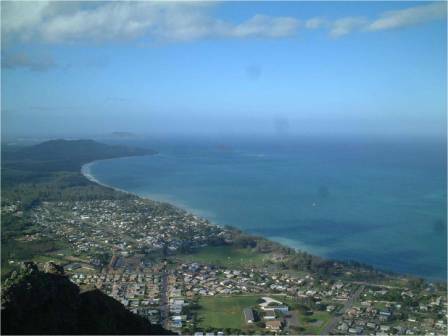 One objective of the Hawaii Coastal Zone Management Program is to reduce hazard to life and property from tsunami, storm waves, stream flooding erosion, and subsidence. View of the Waimanalo coastline, Island of Oahu. There are two major approaches to dealing with erosion. The first approach involves shoreline hardening such as physical structures to control erosion. These structures include seawalls, groins, bulkheads, revetments, detached breakwaters and sand-grabbers. The other approach recognizes the dynamics of natural shoreline processes and is referred to as the “soft” approach. Planning efforts such as zoning, shoreline setbacks and special design requirements are utilized to reduce the hazards to life and property. Under the Hawaii CZM Program, a series of special investigations have been prepared, including the reports Oahu Shoreline Study; Kauai Shoreline Erosion Management Study; Hawaii Shoreline Erosion Management Study; Erosion Management Program Recommendations for Hawaii; and Aerial Photograph Analysis of Coastal Erosion on the Islands of Kauai, Molokai, Lanai, Maui and Hawaii, and the video Planning for the Inevitable. These reports discuss beach management alternatives, generally and at case study sites; identify critical erosion location; and provide a time-series of shoreline position data for use in determining erosion trends. The data also provide a baseline for monitoring future erosion in these areas.